Aurelian provides the test results from the Lilieci-1 well, onshore Romania. Lilieci-1 was drilled as a deep test of the Sarmatian gas play in the EIII-4 Bacau Concession along the eastern front of the Carpathians. Potential reservoir horizons consisted of sand bodies trapped within a background lithology of claystones. The well encountered a thick over-pressured section with high gas readings between 1,750 meters and total depth at 2,980 meters. Definition of net pay with wireline tools proved difficult because of their limited resolution. Consequently two flow tests covered a number of sands and production logging was then used to delineate pay zones. A test of 31 meters of perforations in four separate sands in the interval between 2,412 meters and 2,584 meters flowed gas at rates up to 122 thousand normal cubic meters per day (4.6 million standard cubic feet per day) at a wellhead pressure of 165 bar. Production logging measurements indicated that 10 meters of perforations in three sands produced dry gas. The well is being completed in these three productive zones to allow a long term test. The other test of 24 meters of perforations in two sands in the interval between 2,846 meters and 2,915 meters only recovered minor amounts of gas and condensate with water. This zone is not commercial. Aurelian will be appraising Lilieci with its partner, Romgaz, operator of the 850 billion cubic feet Roman-Secueni gas field some 7 kilometers to the north. Further step-out options available include sidetracking the current well to test the extent of the productive sands encountered in Lilieci-1 and to evaluate potential deeper targets. 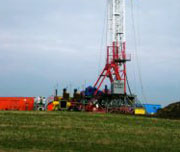 The possibility of drilling an appraisal well is also being considered. The partners in the Lilieci-1 well are Aurelian (operator) 41%, Romgaz 40% and Europa Oil & Gas plc 19%. Under the terms of an agreement between Aurelian and Europa under which Aurelian has paid a proportion of Europa's share of the well costs, Europa now has 60 days to elect whether to participate in the appraisal and development of the Lilieci discovery or to assign its interest in the discovery to Aurelian. If it elects to participate, Europa will pay Aurelian a sum currently estimated at €4.5 million for the aggregate of its unpaid share of the well costs and an agreed premium. Michael Seymour, Managing Director commented, "Lilieci-1 is our third successive successful well in Romania, following Fratauti-2 and Vicsani-1 in the Brodina EIII-1 concession. The flow rates and net pay on test indicate that we can expect to develop it as a commercial discovery. The well is our first well in the Bacau concession and highlights the general potential of the block. It particularly focuses attention on the potential of our two other strong leads, Schineni and Siretu which are close to Lilieci and, like Lilieci, on the outskirts of Bacau, an important industrial city of some 200,000 population."